The Speaker’s gun control legislation which we discussed a few weeks ago and updated last week looks poised to pass by the end of the day. As of last week, a conference committee consisting of Representatives Ron Mariano, Garrett Bradley, and George Peterson, and Senators James Timilty, Anthony Petruccelli, and Bruce Tarr was working to draft a compromise bill from the two bills then before the legislature, H4278 and S1126. The Senate bill differed from the House bill most notably in a provision that removed some discretion from police chiefs in issuing firearm identification cards for rifle or shotgun owners. The compromise bill, H4376, allows a police chief to petition a judge in district court within 90 days to deny a rifle or shotgun permit. This provision removes the burden potentially placed on citizens in the House bill to fight a police chief-issued denial in court and differs from the Senate bill by maintaining some discretion for police chiefs to take action if they feel it is needed. This bill contains a number of provisions in line with the principals set forth by the BBA’s Gun Control Working Group including multiple sections that attempt to bring the Commonwealth in line with the federal National Instant Criminal Background Check System (NICS). The Working Group was comprised of attorneys with diverse backgrounds – gun owners, civil libertarians, a prosecutor, criminal defense attorneys, a law professor and health law experts, this group met several times last year to review all of the then-filed gun laws. A bill streamlining adult guardianship issues also appears to be nearing enactment – S2249, “An Act relative to uniform adult guardianship and protective proceedings jurisdiction,” was ordered to a third reading in the House yesterday. The bill unanimously passed the Senate earlier this month. The BBA’s Trusts and Estates Section supported a prior version of this bill and general principles of a uniform law on this issue, a position that was approved by the BBA’s Council in November 2013. The bill requires cooperation between courts on guardianship and protective proceedings and authorizes courts to decline to exercise their jurisdiction if it determines at any time that another state’s court is a more appropriate forum. Essentially, this law attempts to synchronize the guardianship system across states, thus improving communication between different state probate court judges, making issues of jurisdiction and enforceability of guardianship and conservatorship orders more efficient, and saving the time and resources of the probate court and attorneys practicing therein. An attorney voir dire bill received a fair amount of press in the past few weeks. The original bill, H4123, passed in the House in early June. It proposed a number of changes to certain judicial procedures including permitting attorney-conducted voir dire in Superior Court cases. Those in favor of the bill argued that a majority of states had similar laws and that such laws helped to level the playing field and eliminate discrimination from venire. Opponents of the bill expressed concern that it would increase costs for the courts and local businesses by requiring more potential jurors to be summonsed and increasing the time spent on jury selection from a few hours to possibly several days. The Senate’s Committee on Ethics and Rules amended the bill and shortly thereafter the Senate passed SB2296. This version of the legislation included language that appeared to give judges more discretion in the process than the House’s version. The House concurred with the Senate amendments, and as of yesterday the bill was enacted by both houses and laid before the Governor to be signed into law. It looks like it’s going to be a busy day – and possibly a late night – over at the Statehouse as legislators work out the final details of these and other bills. As we keep an eye on the end of this session, we’re already looking forward to the months ahead and will continue to keep you updated on all our legislative happenings. 30 years for juveniles convicted of first degree murder committed with extreme atrocity or cruelty. Speaker Robert DeLeo’s gun bill, H4278, which we last discussed a couple of weeks ago, went before the Senate last week. The Senate passed it’s own version of the bill, S1126; although very similar to the House’s bill, it notably limited discretion for police chiefs in granting rifle permits. Earlier this week, the legislature appointed a conference committee consisting of Representatives Ron Mariano, Garrett Bradley, and George Peterson, and Senators James Timilty, Anthony Petruccelli, and Bruce Tarr to draft a compromise bill. The committee is still working to reach consensus. The BBA’s own Gun Control Working Group, comprised of attorneys with diverse backgrounds including gun owners, civil libertarians, a prosecutor, criminal defense attorneys, a law professor, and health law experts, met several times between April and July 2013 to review all of the gun legislation filed by that point – roughly 60 bills. They composed a set of ten principles we use as a lens through which to consider new gun legislation. Both the House and Senate bills contained many of their points of emphasis and we are interested to see how the final bill will mesh with their considerations. Our spotlighted bill from last month, S705, a revision of the spousal elective share procedure in Massachusetts, was the subject of a recent meeting at the Statehouse. Led by Senator William Brownsberger, the meeting brought all the parties interested in the bill, both support and opposition, into one room. These experts, including BBA representatives who have spent more than a decade working for spousal elective share reform, engaged in nearly three hours of discussion. They found consensus on a number of issues in the sometimes tense, but ultimately extremely productive meeting. Both support and opposition groups are continuing to work together to reach a mutually agreeable bill. Whether that will happen before the end of formal session remains to be seen. The end of session is always a busy time, and this year is proving no different. In this final week, we may see major movement on these and other bills. We will continue tracking all the bills of interest to the BBA and our members and do our best to keep you up to date on their progress. While juvenile justice issues have played a major role in the legislature in the past year, they have been a part of the BBA’s agenda for decades. The BBA has long supported bills abolishing juvenile life without parole sentences, as Massachusetts over time became one of the last states permitting these sentences for youths as young as 14. In early December, the BBA’s Council approved principles drafted by our Criminal Law and Delivery of Legal Services Sections opposing juvenile life without parole sentences. Fairness – Legislators and panelists alike raised fairness considerations for victims and their families, society generally and specific communities, as well as the defendant. Confidence in the justice system – Those advocating for longer parole eligibility terms touted their confidence in the justice system, stating that only juveniles who committed the most heinous crimes were sentenced to life and thus merited a longer time before parole eligibility. Those advocating for shorter parole eligibility terms expressed confidence in the parole board’s ability to determine whether a person was adequately rehabilitated before potential release. They stressed that parole eligibility did not equate to release. Potential for rehabilitation – Testifiers advocating for shorter parole eligibility terms cautioned against the mere warehousing of convicts and expressed concern that juveniles sentenced to life with long periods without parole eligibility would suffer due to lack of program and rehabilitative opportunities (priority is given to those closer to potential release) and the challenge of staying in touch with family and friends for such an extended period of time, a parole board consideration. Now, a couple of months later, the legislature is primed to address all of these concerns. The House passed a juvenile justice bill, H4184, on June 18 by a vote of 127-16. The bill called for parole eligibility for juveniles convicted of first degree murder in 20-25 years, specifying that those convicted of first degree murders that were premeditated or committed with extreme atrocity or cruelty would be parole eligible after 25-30 years. A few weeks later on July 8, the Senate passed its own juvenile justice bill, S2246, by a vote of 37-2. The Senate version granted parole eligibility in 20-30 years, specifying that a juvenile convicted of first degree murder committed with extreme atrocity or cruelty would only be parole eligible after 30 years. A Conference Committee consisting of Representatives Christopher Markey, Garrett Bradley, and Bradford Hill and Senators William Brownsberger, Jennifer Flanagan, and Bruce Tarr then drafted a consensus bill, H4307. This version calls for general parole eligibility for juveniles convicted of first degree murder in 20-30 years. It requires 30 years of jail time for those convicted of murders of extreme atrocity or cruelty and 25-30 years for juveniles convicted of first degree murder with deliberate premeditation and malice aforethought. The consensus bill also creates a commission to study and determine the usefulness and practicality of using a developmental evaluation process for juvenile first degree murder cases. The goal of the evaluation process would be to determine the developmental progress and abilities of the juvenile offender at the time of sentencing and parole eligibility. The commission is tasked with establishing factors to analyze in determining the developmental progress of a juvenile offender. The consensus bill will now go to each house of the legislature for their final consideration. We will continue to monitor this and all the other bills of interest to our members in these final weeks of the legislative session. Late Wednesday evening, the House passed a gun violence prevention bill by a vote of 112-38. The bill, H4278, is the latest version of legislation that has been in the works since March 2013 when Speaker DeLeo first convened his Gun Law Task Force to study the issue. The Speaker’s Task Force met more than 15 times between March and December 2013, releasing a list of 44 recommendations for gun laws in February of this year. At the same time, the BBA’s own Gun Control Working Group conducted a lengthy study on gun reform. Comprised of attorneys with diverse backgrounds including gun owners, civil libertarians, a prosecutor, criminal defense attorneys, a law professor, and health law experts, the Working Group met several times between April and July 2013 to review all of the gun legislation filed by that point, roughly 60 bills, and compose a set of principles designed to be a lens through which any new gun law could be considered. But the origins of this debate stretch back to the beginnings of this country. 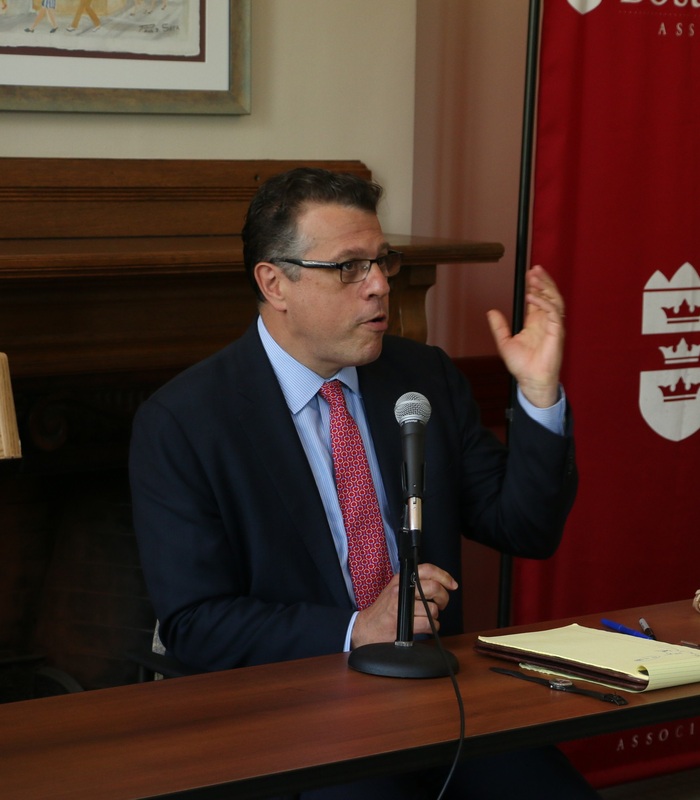 In early June, the BBA hosted A Conversation with Michael Waldman, President of the Brennan Center for Justice at the NYU School of Law. Waldman addressed a number of policy issues, including the findings detailed in his new book, The Second Amendment: A Biography. This project took him on a historical journey through gun laws, propaganda, and politics, tracing the earliest gun rights to militias at the start of the United States. Early Americans cared passionately about militias, which are unlike anything we have today. Every adult male aged 16 to 60 was part of this local unit, and as a result was required to own a gun and keep it in his home. Early Americans saw these groups as a bulwark against tyranny, a political check, and an alternative to a standing, professional army, the ultimate symbol of a king’s power which they had just fought against and defeated. Thus, gun ownership embodied an individual right to fulfill a civic duty as a militia-member. When the Bill of Rights was debated, its shortest clause, the Second Amendment, received little public discussion, none of it focused on whether the Amendment was an individual right – it was all about militia service. The role of militias was so entrenched, and the world was such a different place, that it was not considered the least bit controversial. As the country developed, Americans always had guns and there were always gun laws. The Supreme Court largely stayed out of the debate until a 1939 case, United States v. Miller, in which it upheld the first federal gun law, essentially saying that the Second Amendment only protected militias, not individual rights. However, as the country has evolved, this thinking has changed. In 2008, the Supreme Court found an individual right to gun ownership, but noted that this right could be limited, in District of Columbia v. Heller. While all circuits have grappled with this issue, they have overwhelmingly upheld gun laws. Back to the gun violence prevention law at hand in Massachusetts: in early June, the Speaker introduced a bill, H4121, which quickly became the subject of discussion, praise, and concern for many in the state. As a result, its progress was again shelved while legislators worked on revisions to gain greater consensus, a tall order on any bill, much less one as controversial as gun control. However, this patience appears to have paid off in the bill’s new version, numbered H4278. Representative George Peterson, a Republican and longtime advocate for gun rights, voted in favor of the bill, and the Gun Owners Action League (GOAL), which had opposed the old version (H4121), took a neutral position on the new one (H4278). The bill now goes to the Senate with just 22 days remaining on the formal legislative calendar. We will continue to monitor this piece of legislation and keep you updated on its progress. We’ve done our best to keep you up to date on the budget process this year, and it’s almost done. To recap, way back in January, the Governor filed his budget recommendations bill. In early April, the House Committee on Ways & Means made its budget recommendations. The House completed its budget in early May, the Senate Ways &Means Committee finalized its budget a couple of weeks later, and the Senate completed its budget at the end of May. Since then, the budget has been before a six member Conference Committee consisting of Representatives Dempsey, Kulik and deMacedo and Senators Brewer, Flanagan, and Ross. On Sunday, June 29th, the Conference Committee finalized its budget recommendation, and on Monday, the House and Senate approved this joint budget. At this point, the budget is under review by the Governor, who has ten days to approve or veto the entire budget, veto or reduce specific line items, veto outside sections, and/or submit changes as an amendment to the budget for further consideration by the legislature. Our chief areas of interest in the justice system – judiciary funding in the form of: the Trial Court, legal services, and state attorneys – fared well, but still face a number of challenges. Conference Committee – $612 million – this amount is in between the House and Senate appropriations, but is $3 million below the Court’s maintenance request. It includes $3 million for the specialty court module. MLAC requested $17 million for FY15. This amount would cover current costs and allow for the hiring of 40 more attorneys in addition to offering some future stability. This funding level would expand the amount of services its programs could provide to vulnerable residents across the state and also help boost the state economy. As funding for civil legal aid has declined, mostly through a large drop in IOLTA revenue, the economic benefits resulting from civil legal aid have also dropped. At the same time, the need for civil legal aid has grown — close to 1 million people in Massachusetts qualify for this aid, and programs currently turn away 50 to 70 percent of eligible residents. Last year, MLAC received $13 million in funding. Conference Committee – $15 million – Representative Ruth Balser and Senator William Brownsberger sent a letter co-signed by 50 other legislators to conference committee members voicing their support for $15 million in MLAC funding. We reached out to our members along the way, asking you to contact your legislators to voice your support for civil legal aid funding. Thank you for all of your help – we are confident this level of appropriation wouldn’t have happened without you. At this point we encourage you to continue building your relationships at the Statehouse by personally thanking your legislators for their work and reach out to the Governor for the final budget step, urging him to sign on to the $15 million MLAC appropriation. Senate Ways & Means Budget – $13 million – Senator William Brownsberger and Senator Cynthia Creem filed an amendment requesting increasing this line item to $17 million. It was amended to a $1 million increase and adopted. House Ways & Means Budget – $13 million – Representative Ruth Balser filed an amendment (#157), co-signed by 71 Representatives, proposing to increase the MLAC budget line item to the requested $17 million. It was included in a consolidated amendment as a $2 million increase for the final House budget. The budget is a long and complicated process, but it is almost finished and we hope that regular updates like this have helped you stay engaged with some key judiciary appropriations. Thank you to everyone for your involvement, especially with legal services funding. Stay tuned for a final update likely only a few days away.